International court of justice or ICJ is the safe keeper and protector of the rights of the entire international community. International Court of justice was established under a United nations charter. ICJ is the main judicial body of the UN. This is stated in the article 92 of the UN charter. The ICJ came into existence after the World war II. Out of these 15 members, there are 5 judges who are elected after every three years. The tenure of each member of ICJ is 9 years and re-election is also possible. The quorum of 9 members is considered full and complete to deal with any matter. The only criteria for the selection of ICJ Judge is that the nominee judges must be qualified to be appointed as the highest judge in their respective country. One of the main conditions for the selection of ICJ Judge is that no two judges in the ICJ can be from the same country. If there is a conflict to choose the identity nation of the judge, then the country where all his civil political rights are exercised would be regarded as his original country. The method of selection of an ICJ judge is that all the UNO member states make a list and present it to the UN general assembly and UN Security Council. It is then that the general assembly and security council make an appointment after mutual discussions. Though discussions take place between the general assembly and security council on whom to appoint but the decision should be taken by the GA and SC independently of each other. There is a voting process in Security Council and United Nation for the selection of ICJ Judge. When a member wins majority votes in both these arms of the UN then that judge is deemed elected. The process of removal of these judges is rarely needed and they cannot be asked to vacate office until and unless all other judges agree that a particular judge no longer fulfills conditions precedent to one being a judge of the ICJ. The judges have to mete out judgments on the basis of what is incorporated in the international law on the date of the decision. There is a limitation for these judges though under which these judges cannot hold a political, administrative or other professional posts. Plus, no ICJ judge can act as an advocate in any matter. ICJ enjoys three different kinds of jurisdiction. The first being contentious jurisdiction, the second being compulsory jurisdiction and finally advisory jurisdiction. When two parties consent to bring the matter to the ICJ then the jurisdiction of the court is called contentious jurisdiction. This consent can be gathered by the court from the conduct of the parties and need not be expressly given by the parties. This principle was laid down in the case law Cameroon vs. Nigeria in 2002. When the jurisdiction of this court is derived from a special clause provided in bilateral and multilateral treaties then that is useful in deciding disputes based on the treaty and the application of the treaty. This forms part of compulsory jurisdiction. Other provisions of compulsory jurisdiction are solving a matter of international law, and when there has been a breach of international obligations which existed and when quantum of damages for this breach have to be calculated. These provisions are contained in Article 36(2) of the statute of the international court of justice and the aim of this provision is to extend the jurisdiction of the court. Last of all is advisory jurisdiction. This is meant for cases where the General assembly, security council or a member state seeks advice from ICJ. The court shall have its seat at Hague and will have members including president and registrar who will be present at the seat. However, the court may hold its proceedings anywhere except its seat if it so deems fit. French and English are the official languages of the court. ICJ judge Justice Dalveer Bhandari recently got re appointed as a ICJ judge. This makes India win 3 important UN positions in recent times. The second position was earned by Soumya Swaminathan (deputy director general for WHO programmes). In recent news regarding the re-appointment of an ICJ judge the justice from India Justice Dalveer Bhandari was competing with UK's Justice Christopher Greenwood. 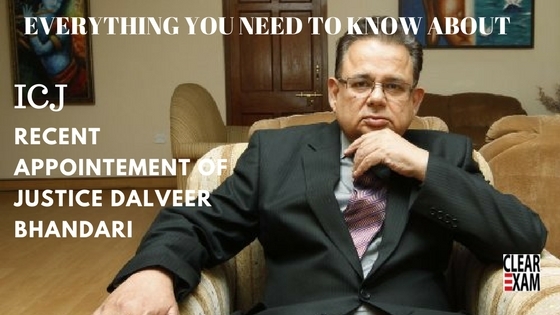 Justice Dalveer Bhandari saw the support of the majority in general assembly i.e. two third of the 193 members of General assembly were supporting him and Greenwood got 50 general assembly votes. This depicts the changing global environment. But, the 5 security council members were seen supporting Justice Christopher Greenwood which made Justice Greenwood lead with 9 votes in the SC wherein only 5 votes of SC went to Justice Dalveer Bhandari. This was the situation after 11 rounds of elections because a member needs a majority in both GA and SC to win and none of the two members was able to make that happen. Therefore there was no clear winner announced even after 11 rounds because one member (India) had clear support of the general assembly, and the other member (UK) had a clear majority in the security council. In such a scenario what also happens usually that the winner of the majority of General assembly is re-elected. After the last and final round ( round 12) India's nominee won and the five security council members- USA, Russia, China, France, and the UK are seeing this as a precedent which they do not want to be repeated because if now the UK can lose then in the coming years these 4 powers could lose too. This Indian victory happened when the UK withdrew its nomination and thus lead to Dalveer Bhandari being re-elected as a judge to the most auspicious court of the world. The security council membership is counted as very prestigious because the permanent members get to decide UN rules and have a veto power to make things start and stop. Usually, permanent security council members throw weight in the UN and it is the first time that UK didn't get a clear victory which shows a great deal about changing the international climate. This was the hard work of the Indian Government and the permanent mission of India to the UN who gave it their all while trying to convince the UN that the member who gets good majority in the UN general assembly should be re-elected as the ICJ judge as that is the rule that UN and ICJ has been using in all recent cases of similar nature and not one who wins according to the joint conference mechanism as the joint conference mechanism is an age old mechanism which has never really been in use for a century. Read the complete information on the appointment of Justice Dalveer Singh Bhandari and about International Court of Justice.